This morning, we found this endorsement posted on NESCA's Facebook page which--thank you very much!--is fast closing in on 2000 "Likes." From a highly-respected local advocate, it refers to NESCA Director of Behavioral Services Jessica Minahan. "Jessica's common sense and functional approach is a continuing source of fresh air. Her focus on what the communication is saying rather than on the behavior is key. 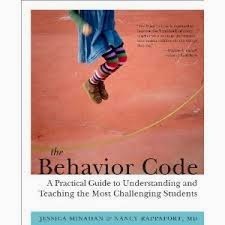 Re-framing the purpose of FBAs and the ABCs of behaviorial interventions and supports will help children at the core of their challenge areas, rather than merely shifting a less appropriate behavior for one that is more socially acceptable." We're totally with Jennie on that! In her spare time, Jessica managed to co-author "The Behavior Code: A Practical Guide to Understanding and Teaching the Most Challenging Students," with Harvard Psychiatrist Nancy Rappaport, and more recently, to write "The Behavior Code Companion: Strategies Tools and Interventions for Supporting Students with Anxiety-Related and Oppositional Behaviors." A speaker in demand nationally, Jess is also an adjunct professor at Boston University and a blogger on The Huffington Post. Read her latest HuffPost piece HERE.